I was planning on skiing easy today due to my aching body, but my co-workers convinced me otherwise. It is the second-to-last day after all. Alex, Colby, Will, and I decided to ski No Name. We took the tram to the top of the mountain at about 1:30 to start our adventure. Our first leg of the trip was to boot pack up Cody. 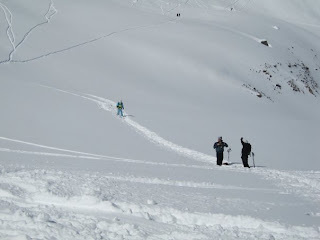 Will, Colby, and I skied Puckerface. Alex skiied Four Shadows. 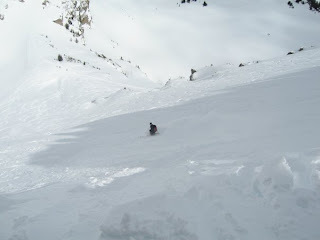 Puckerface is incredibly steep and fun to rip down, but the ride only lasts a few seconds. 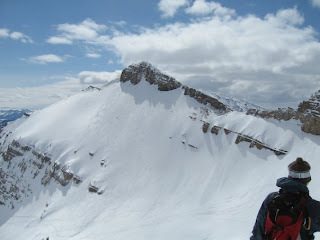 From Cody we hiked up Powder 8 and traversed around the back towards No Name Peak. 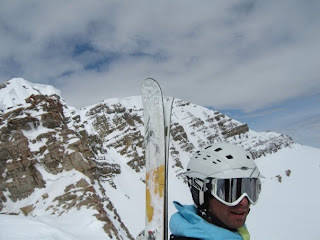 After a short boot pack we were at the top of the face we wanted to ski. No Name was decent snow with a good pitch. Definitely a little more rewarding than Puckerface. 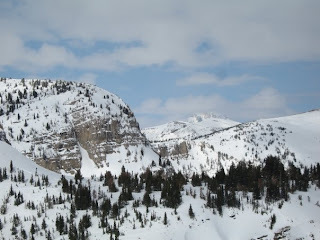 Our original plan was to ski down Pinedale Canyon to get back to the resort, but we decided that after going as far as we had, we might as well do one more boot pack and ski No Name Canyon. 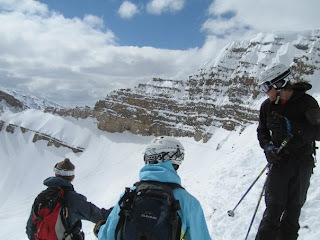 Our ski consisted of four boot packs, a traverse, and then a long traverse back in-bounds from No Name Canyon. We made it back in-bounds to the Union Pass lift at 4:30, barely before closing. After skiing, I met up with the girls and downed a huge platter of nachos, a plate of sweet potato fries, and some beers. We then proceeded to make a quick stop at Dairy Queen for dessert. That was needed.